Suffering a little from sunburn, and hoping to find lots of people to speak French with on Bora Bora left me disappointed. There was no point going on a beach excursion, and Dutchy and I are probably a bit tired of seeing anything at the moment, as we’ve been tourists for so many weeks now. We are using this cruise more for relaxation than the total tourist package. 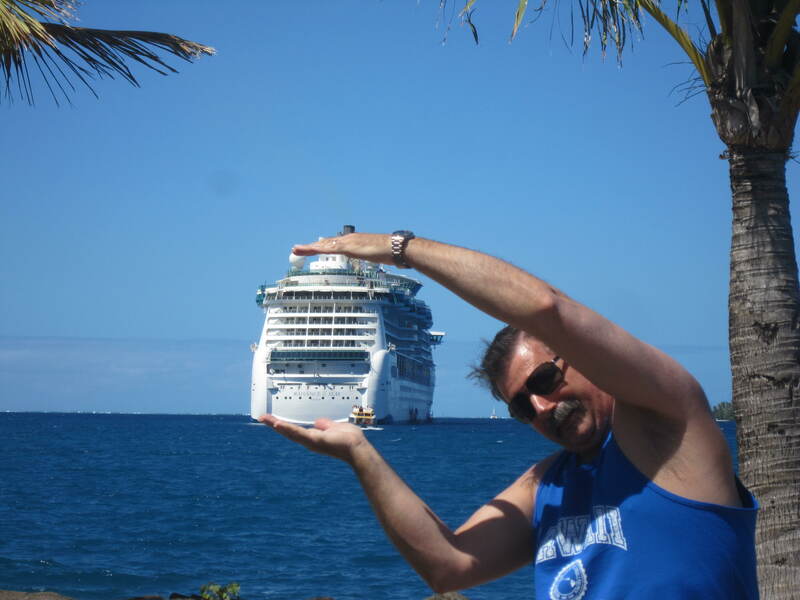 We love cruising, and know we plan to do further cruises, so there is no rush to see and do everything everywhere. This is the holiday everybody talks about when they say “I need a holiday after this holiday.” We are really lucky to be living that dream. Nola and Tony have helped by cat-sitting, house-sitting and karaoke-sitting while we wend our way around the world. On Bora Bora we managed to buy Dutchy some new socks, and some safety pins so I could alter the red tropical dress I bought in Tahiti to wear to dinner. Ironically, when I looked at the label, I found out that it was made in Indonesia! Most other souvenirs one buys seem to be made in China. It’s very special when you actually find something that is made in the country you are visiting, such as the beautiful stingray key ring for my collection, possibly made from pewter. We returned to the ship and enjoyed having a little more space there, because half the boat was still on the island. We chose the opportunity to have a pleasant lunch in the more formal dining room. Days at sea are a good time for working on the blog and updating it. 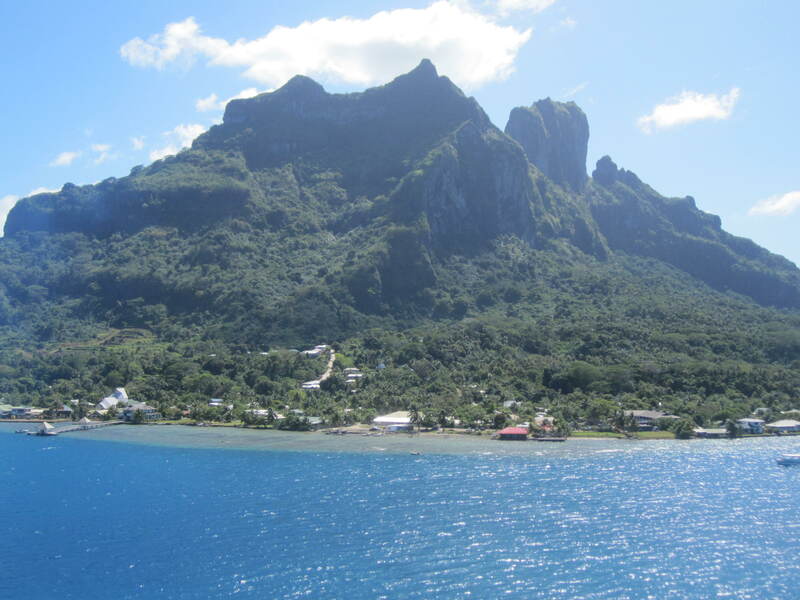 When we were docked near Bora Bora and had returned to the ship, we thought it might be a good idea to post another entry. At 40 cents a minute (for our large $100 package) we tried to be as efficient as we can, which is not always that easy when the internet is excruciatingly slow, and we gave up trying to upload photos. This is the price of being a blogger. The signal in that area was dismal, so we waited until the following day to add the photographic evidence, which only scratches the surface of the number of photographs we have actually taken. Does anyone have a spare few hours for the “slide night”? I jest, as what I would really like to do is create a DVD of snapshots of our trip, but one which doesn’t go for too long. People are most interested in their own photos, but fellow travellers like seeing a (limited) selection. Now we only have an hour left of internet, so I have painstakingly planned that we can have four fifteen minute sessions until we return home. This blog has not been in “real time” as it is usually a week or so behind. When we get home I will still be blogging for another week I suspect, but at least it will be in the comfort of our own home and on the internet where we get almost unlimited for less than we’ve paid for our scattered seventeen days on the cruise! After a particularly enjoyable Headliner Showtime, entitled “The Dangerously Clean Comedy of Jason Chase,” Dutchy and I decided to go to the cinema if there were a seat available, to find only one other couple there. “The Dilemma” with Vince Vaughan and Winona Ryder obviously didn’t appeal to them, so it ended up with just the two of us in the theatre for our very own personal private screening of the movie. Oh, I love being a princess! 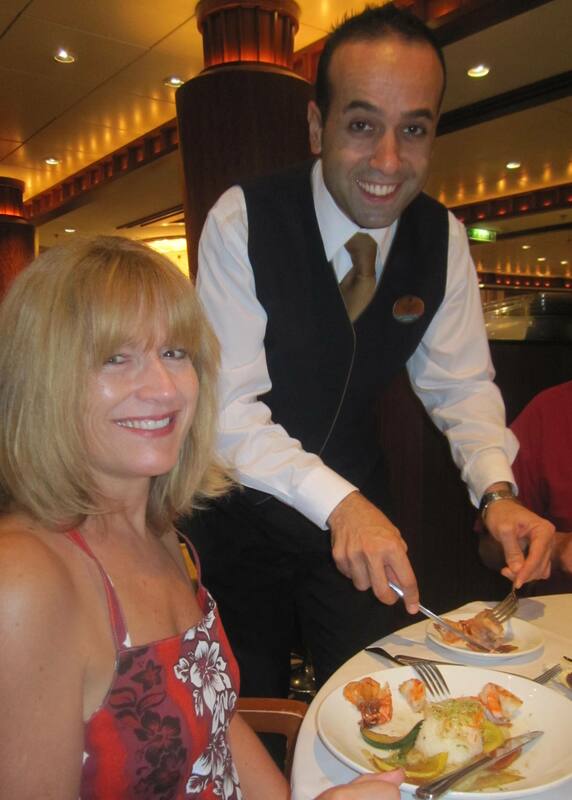 This entry was posted in French Polynesia, Royal Caribbean International Cruise and tagged blogging, Bora Bora, movie, showtime, souvenirs. Bookmark the permalink.